We offer you our program „IP Address History“ for free download and free usage (freeware / free software). What’s „IP Address History“ good for? The program log your own IP address. 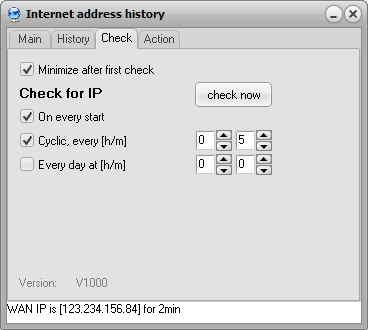 It shows your current IP address and log – if and when your IP address has changed (IP address logger). – if your IP address remains the same over a certain time. On those situations you can define differnt actions, like show a message using a flyout window. Also you can define a external action, e.g. start a script or program. All actions will be stored in a logfile on your harddisk. So you can also see, what IP address your computer or network had at a certain time. The program is delivered as setup program for windows. Start the installation program to install the software. The program consist of a single exe file: This file can be also copied to another pc. Normaly the program will be installed into the autostart group of the computer. So it will be started when your pc is started and run in background. After the start the state screen will be shown. Then it will continue to run in the background. Inside the windows taskbar notification area (TNA), normally at the bottom right corner of your screen, a icon with a earth symbol connected to a network will apear. A click on this symbol show the program state screen again. The state screen show 4 pages: Main page In a overview you see the current data. 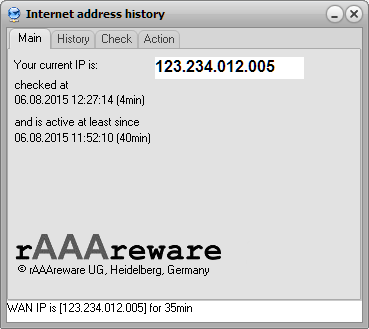 – The current WAN-IP address. 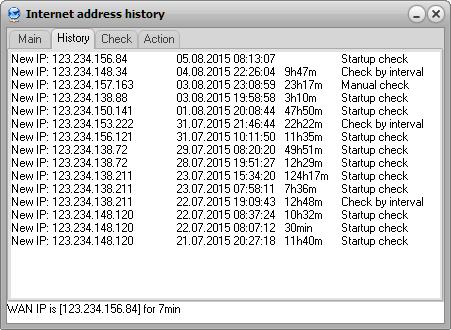 – The timestamp this WAN-IP address was detected. – How long this address is active already. The protocol screen shows the last entries of the log on disk. With a double-click you can open the logfile in a editor. Minimize after first check: The program will be minimized after a short time or after the first check and continue to run in background. – Cyclic every h hours and m minutes. Configuration of the actions triggert on certain events On a new IP – Show message – Confirm the message – Execute a program/batch file On a constant IP for a certain time – Duration in days, hours, minutes – Actions like above (message, confirmation, execution) Additional you can define a manual action, triggered with a left mouseclick on the TNA program icon. This can be used e.g. to manual reconecct a router by script to get a new IP address. With the IP address of a computer or a network every datatransfer in the internet can be tracked back to the origin device. On a small office or home network (SOHO) the IP address is given normaly dynamic: This means, everytime your router get connected to the internet he get a new IP address from the provider out of a address pool. This address is used as long the router is online. Next time your router connect he will get a new IP address. A assignment of the IP address to your computer – which means: to you as person – can only be done by you internet provider. To be able to identify you – e.g. on request of persons or institution who has the right to get this information – your internet provider stores this information for a certain time. Only a small cirle (or maybe the government on certain countries) has the right to ask for this data. In practise it is fact, that your IP address often do not change for a very long time. This is because you may have some devices in your office or home area which run all the time and send more or less data over the internet. This avoid a reconnection of your router. Your IP address stays the same for days, weeks or months. Thus your computer is very easy to identify – cause your computer (or you) may send a lot of data which can be assigned easy to your computer. To identify a computer – means person – it is therfore not neccessare to ask your provider: You just give this information by yourself. As soon your identify yourself in the internet you will be assiged with this identity to your IP address. At least for the ower of the requested webpage or service it is easy to identify you. It is also quite thinkable that this information is shared between the operators or companies behind the pages or services – e.g. with advertisment companies. Additional you have other mechanisms to identify a user – e.g. by cookies or the brower fingerprint / footprint. Those oppertunities only exist in browers and using the HTTP/HTTPS protocol. Cookies you can control quite easy, also automated, by yourself using your brower settings. Also some cookies may make sense for you and give you comfort using the internet. To control you browser footprint you may configure your broser to a most general configuration. Other internet pages give you hints for this. https://panopticlick.eff.org is a good option to check how unique your brower in its current configuration is. Another usecase for the IP history is, if you do not want or expect your IP address to change: The program generate a warning or raise an action if the IP address changes. Others The program was not build to hide or blur the identity in the internet. It just helps to protocol your identity and give you the chance to request a new IP identiy. To obscure or hide your address within your brower activities there are other programs. A possible disadvantage on obscure your address is may a worse performance or an incompatibility with some browser actions. Except where otherwise noted, all of the documentation and software included in this program is copyrighted by rAAAreware UG (haftungsbeschränkt). Copyright (C) 2015 rAAAreware UG (haftungsbeschränkt). This software is provided „as-is,“ without any express or implied warranty. 1. All redistributions of source code files must retain all copyright notices that are currently in place, and this list of conditions without modification. 2. All redistributions in binary form must retain all occurrences of the above copyright notice and web site addresses that are currently in place (for example, in the About boxes). 3. The origin of this software must not be misrepresented; you must not claim that you wrote the original software. If you use this software to distribute a product, an acknowledgment in the product documentation would be appreciated but is not required. 4. Modified versions in source or binary form must be plainly marked as such, and must not be misrepresented as being the original software. using ICS components – many thanks to http://www.overbyte.be!